Home / Jared Bernstein: On the economy / Trump 2020 game plan: Fake Laffer, Go Keynes. Trump 2020 game plan: Fake Laffer, Go Keynes. I’m genuinely sorry to intrude on your Sunday like this, but this new forecast (no link) from the highly-skilled Goldman Sachs economic research team (GS) has me completely on shpilkes. I’ll make it brief, but not painless. Back when the tax cut passed, this figure, also from GS, previewed an important fiscal fact about to unfold: outside of wartime, the Republican tax cuts and other deficit spending would add more fiscal juice to an economy already closing in on full employment than we’d ever tried before outside of wartime (note that the right-side scale is inverted; the point is low unemployment is usually associated much smaller deficits than we have now). How unusual is [the divergence at the end of the above figure]? Well, looking at data back to the late 1940s, the average deficit-to-GDP ratio when unemployment was below 5 percent was close to zero. Since 1980, that same calculation yields an average deficit-to-GDP ratio of 0.5 percent. As I mentioned, the jobless rate this year may average less than 4 percent while the deficit-to-GDP ratio could be about the same, and closer to 5 percent next year. So, pretty unusual. This is all known, and no reason to intrude on your Sunday. That recent, big 4% pop in GDP was widely and correctly labeled a function of this stimulus and thereby unsustainable. But here’s what’s new. 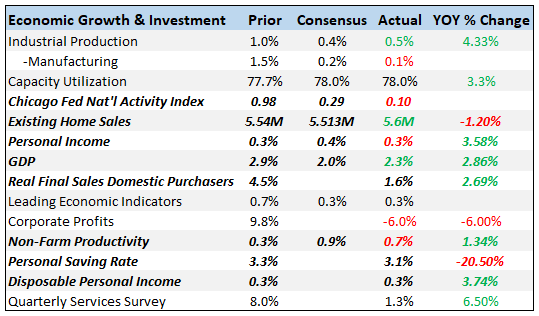 The GS team has an updated forecast based on key, upward revisions, most notably, the doubling of the U.S. savings rate as a share of spendable income. Their reasoning as to why this is going to notably boost growth and lower unemployment to close to 3% by the end of 2020 is this: the savings rate is well above where it usually is given the variables that typically drive it (income, slack, net worth). That means it should fall, implying more consumer spending, the latter of which accounts for 70% of GDP. Based on this revision, the figure below shows their updated prediction for GDP growth and unemployment. First, note that GDP comes off its unsustainable peak, underscoring the unsustainability point: if GS is right, we’re looking at Keynesian stimulus, not Laffer suppy-side. But check out the jobless rate, which hits a low of almost 3% by the end of 2020. Now, 2020’s a long way off and while GS is better at this forecasting stuff than most, nobody’s very good at it. And, of course, conditions in the macro-economy are but one factor in play. If Trump was getting credit for the economy thus far, his approval rating would be a lot higher (though stagnant real wages are of course in play, as I’ve stressed). Also, conditional on price/wage acceleration, the Fed might get spooked by the above scenario and move from brake-tapping to brake-slamming. A couple of final thoughts. First, at one level, the above is a crushing example of the self-imposed budget austerity, back when the expansion was first taking off (see circled area in figure below). Relatedly, let me try to be clear about my beef with all of this. I’ve argued that when an economy closes in on full employment, we want our fiscal accounts to begin to consolidate, as has historically been the case as shown in the first figure (here’s why). But at the same time, if this fiscal experiment takes the unemployment rate down to 3% without triggering overheating and Fed-rate risk, workers may well finally have the full-employment-induced bargaining clout they’ve long lacked, and that will be a very good thing. So…let’s here it for PPP (Potted-Plant for President!!). Share the post "Trump 2020 game plan: Fake Laffer, Go Keynes."